Pest description and crop damage Two types of sawfly are pestiferous in caneberries and cause two distinct types of damage. Onycholyda sitkensis larvae roll leaves and feed within the rolled leaves, which is inconsequential; the main concern is that they can be a contaminant in harvested fruit especially in mechanically harvested fields. Monophadnoides rubi larvae do not roll leaves but feed on leaves, leaving holes on leaf edges or between the leaf veins. 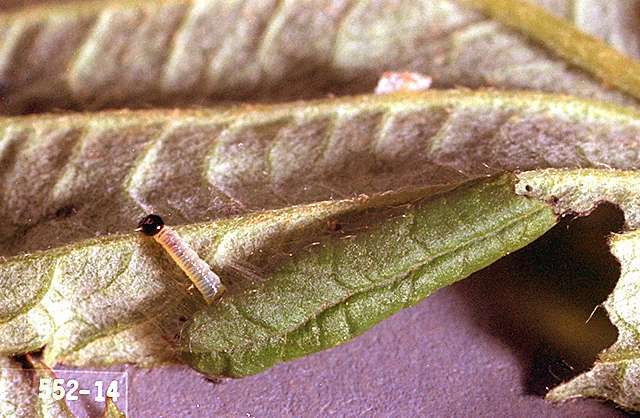 Extensive feeding by Monophanoides larvae may skeletonize the leaves and negatively impact plant vigor and berry yield. They also can be a contaminant in harvested fruit. 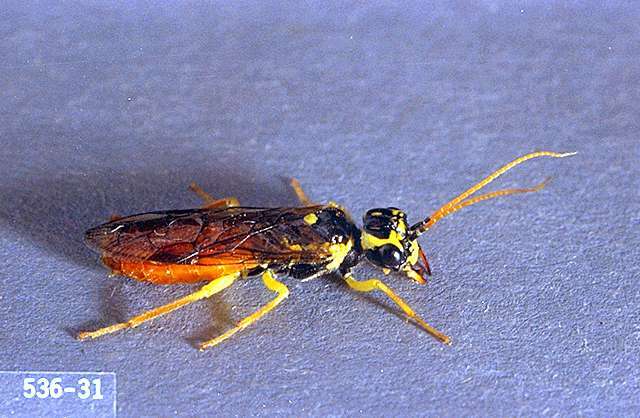 Biology and life history Adult Onycholyda sitkensis sawflies usually have a black body, 10-20 mm long, with yellow spots on the head and thorax. Legs are often yellow and the wings are clear. Adults can be found flying in spring and early-summer. Females lay eggs in or on leaves; larvae hatch out in late spring and early summer, and begin feeding. 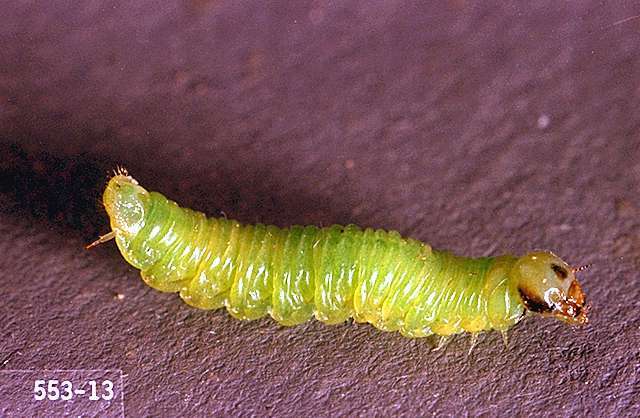 Larvae range in color from tan to green, have a dark head, and can be up to 20 mm long. They may be solitary or form a colony as they feed; they spin cocoons and roll leaves when fully grown. Adult Monophadnoides rubi sawflies are stout-bodied, about 6-12 mm long, and are usually entirely black with clear wings and with legs more pale than the body. They can be found flying in spring and early-summer. 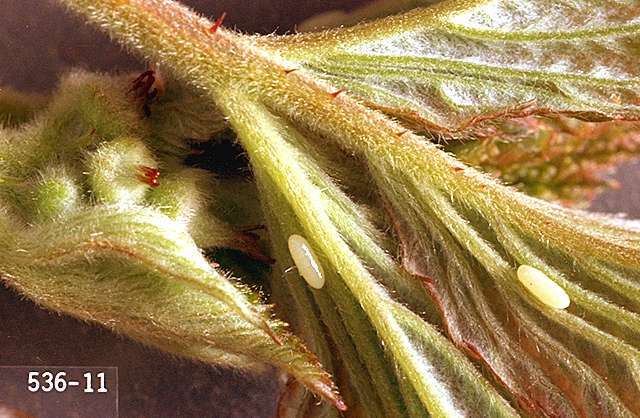 Females lay eggs on or in leaves which hatch in about 10 days. The larvae are 6-18 mm long, pale green with white tufts of spines arranged in rings around the body which gives them a hairy, bristly, or spiny appearance. They are solitary feeders and tend to feed at the tops of plants on the underside of young, tender primocane leaves. They feed for about two to three weeks before they drop to the soil and form cocoons in which they overwinter. There is one generation per year. Scouting and thresholds Inspect plants in late spring for larvae, rolled leaves, or evidence of feeding damage between leaf veins. Larval feeding is not usually a problem but larvae are sometimes a contaminant in mechanically harvested berries. diazinon (several brands) at 1 lb ai/a. PHI 7 days. One application per season allowed; as such, consider other pests that may need to be managed with diazinon. Restricted use pesticide.